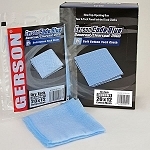 Rich Tool Systems carries all kinds of sanding surfaces including file board sandpaper for all types of file boards. Whether you need stick-on, clip-on, or hook-and-loop (Velcro) Sandpaper strips for your file board, we carry it in several grains. All our file board sandpaper is made from heavy-weight paper to provide the toughness needed for heavy use. With 50 per pack, you'll always have a fresh cutting surface for your file board, and since our packs are sold below retail price, you can stock up and completely avoid running out. At Rich Tool Systems we make a point of keeping our prices low so you'll be able to buy what you need to complete any project, whether you're replacing one item or fully stocking a new workshop.